- Made of clear glass and featuring a sturdy metal frame, this decorative terrarium is perfect for adding a touch of eye-catching style to your small potted plants or for showing off a favorite keepsake in a new and stylish way. - This contemporary art-piece is also perfect to showcase votive candles or tealights. - This glass cube features one flat corner so you can display this decorative glass box at a stylish angle, and one side of the cube is open to makes it easy for you to place items inside. 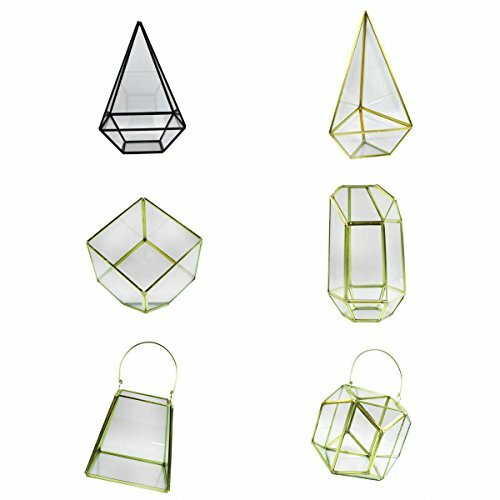 - If you're looking for a modern plant box or a chic decorative accent for candles, make this glass cube a part of your home, deck, or patio today. Modern style and classic elegance can both be yours when you make this lovely artistic glass cube a part of your home or patio. Made of clear glass and featuring a sturdy metal frame, this decorative terrarium is perfect for adding a touch of eye-catching style to your small potted plants or for showing off a favorite keepsake in a new and stylish way. This contemporary art-piece is also perfect to showcase votive candles or tealights. This glass cube features one flat corner so you can display this decorative glass box at a stylish angle, and one side of the cube is open to makes it easy for you to place items inside. If you're looking for a modern plant box or a chic decorative accent for candles, make this glass cube a part of your home, deck, or patio today.